Could Early Stricture After Laparoscopic Gastric Bypass Be a Result of Surgical Technique, Analysis of 1760 Patients? Stricture of the gastrojejunostomy (GJ) anastomosis is reported in the literature as a frequent early complication following Laparoscopic Roux-en-y Gastric Bypass (LRYGB). Published data has shown rates varying from 1.5-27%, with the higher rates reported with the use of a 21mm circular staplers to fashion an antecolic GJ (up to 27%) and lower results when a 25mm device was used (3.2-8%). We believe that using a linear stapler/ hand sewn GJ anastomosis yields the least rate of anastomotic strictures/stenosis. We reviewed the charts of 1760 patients who underwent LRYGB at a Bariatric centre of excellence between 2002 and 2009. All procedures used a retrogastric retrocolic approach to construct the GJ using a linear stapling/hand sewn technique. Intraoperative endoscopic assessment of the pouch and anastomosis was performed in 1757 patients. All patients were followed up in the office with those who had nausea or vomiting undergoing an endoscopic evaluation. 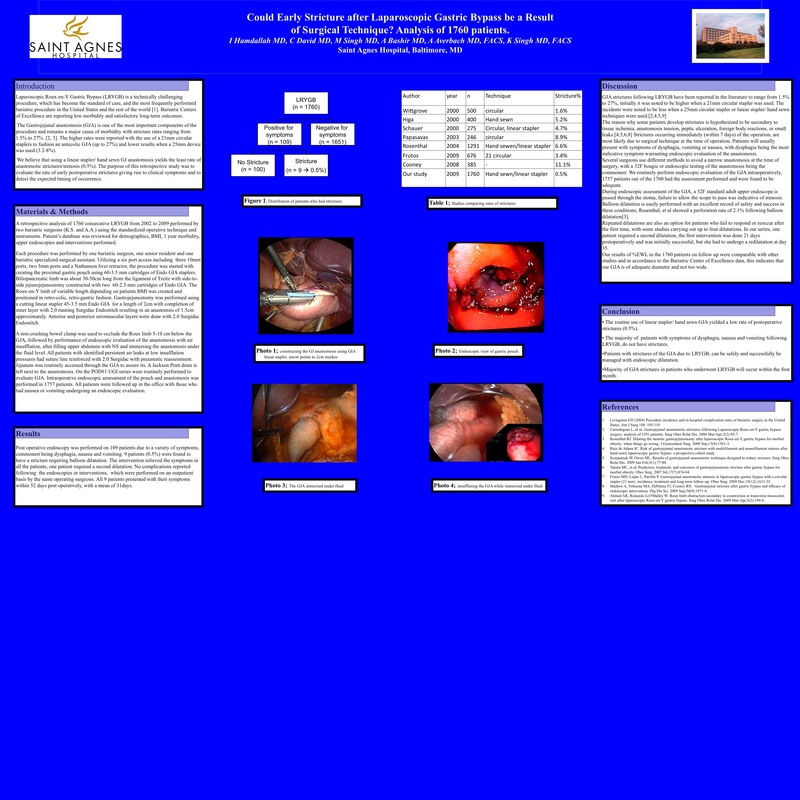 Of the 1760 patients 109 had symptoms warranting endoscopic evaluation, of which 9 (0.5%) were found to have a stricture requiring balloon dilatation. The intervention relieved the symptoms in all the patients; one patient required a second dilatation. All the 9 patients presented with their symptoms within 52 days post operatively, with a mean of 31days. The retrogastric retrocolic approach using a linear stapling technique to construct the GJ results in significant lower rates of stenosis (0.5%) leading to less postoperative complications.